The patented trailer braking system, STEYR S–Brake, which was launched at this year’s GaLaBau in Nuremburg, now provides more stability and safety on demand for the STEYR 6185 CVT, 6200 CVT, 6220 CVT and 6240 CVT models. Combinations of tractor and braked trailers can find themselves in critical situations during transport work on the roads as well as in fields and on grassland, if just the tractor is decelerated by taking your foot off the pedal or via the multi-controller. In these situations, STEYR S–Brake automatically ensures that the brake on the trailed vehicle is activated. Whether you’re working with a trailer, loading wagon, baler or slurry wagon, with STEYR S–Brake, the combination remains “straight” and safely under control. 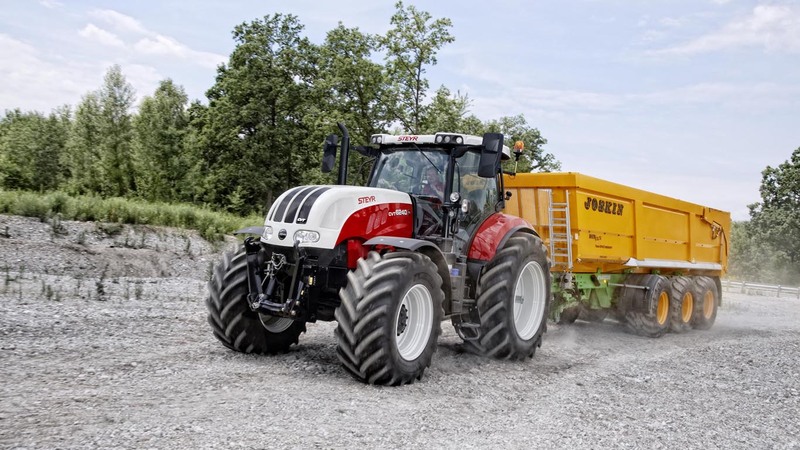 The STEYR S–Brake is activated via the S–TECH 700 monitor, which can be done at any time during the ride, and is indicated by a green trailer icon in the tractor’s gearbox display. It can only be deactivated when the vehicle is standing; the display then shows a grey trailer icon. When the S–Brake function is activated, the system monitors and detects the current ride situation. As soon as the operator reduces the tractor’s speed via the multi-controller or pedal, S–Brake calculates the brake power required to decelerate the trailer. To do this, the torque calculated by a flywheel sensor on the gearbox input and the engine controller data are actively analysed. The tractor and trailer deceleration are reconciled by applying the correct brake pressure on the trailed vehicle, and the combination is stabilised. The activated STEYR S–Brake engages up to a speed of 35 km/h. This upper limit has been set so that operators can adjust their speed in moving traffic without applying the brake. If S–Brake has to engage frequently at speeds of less than 35 km/h, acoustic and visual indicators will inform the operator. Otherwise, the brake will just “pulse” and will pause briefly after every five seconds to prevent overheating and sluggish braking. The STEYR S–Brake option is now available for new vehicles in the STEYR 6185 to 6240 CVT series which are fitted with an air brake system, at a cost of €436. At present all STEYR 6185 to 6240 CVT models, which comply with the European Tractor Mother Regulation can be retrofitted with S–Brake. Other STEYR models will offer S-Brake as an option from the start of 2019.